Truro portable buildings based in Longdowns in Cornwall in between Helston and Penryn, we are a local family run business which has been established for over 30 years now. We are one of the area's leading suppliers of traditional timber portable garden buildings, specialising in timber garden sheds, workshops, wooden garages, chalets, greenhouses, summerhouses, timber home offices, timber dog kennels, timber poultry houses, timber chicken houses, garden timber bird aviarys, wooden log stores, log cabins, studios, gazebos, wooden corner units, garden storage units, timber garden potting sheds, children's playhouses, timber buildings and many, many more. 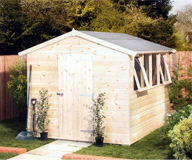 All of our timber portable garden buildings come in a wide variety of shapes, designs and sizes. Whatever style or type of out building you require, we are sure to have a timber building for you. 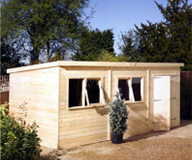 We can even manufacture a special made building to your specification. We offer free delivery to the Cornwall area only, and can erect your purchase for you for a small fee providing you have a prepared level base. We also offer a free, no obligation quotation to all customers, and all our prices include VAT. So please have a look at our site to find out more about us and to see examples of our timber building products and services. We have an on-line order form if you decide on a purchase, or you can e-mail us with any enquires you may have. If you see something you like then why not visit our extensive showroom in Longdowns in Cornwall for a closer inspection, see the contact page for map of our location, address and telephone numbers. Our garden studios and summerhouses are a welcome addition to any garden, giving you many years of pleasure for a small investment. You can reduce your overheads with one of these timber offices / chalet garden buildings that can be installed in your own garden which provides a tranquil setting for you to relax in your own surroundings. These timber portable garden buildings tick all the box's for quality, style, looks and cost, yet sill offer the attention to detail you expect without compromise. We use the best quality materials and they are hand crafted here in Cornwall with superior workmanship built to last. These garden rooms are for all seasons, the wooden garden buildings will enlighten your garden what ever the weather, a sun trap, pure and simple. Whether you want to work from home or you want your work space separate from your home life or if you wish to pursue your hobbies in the area of a lovely garden timber shed or workshop or you just need that extra living space in the area of a stylish log cabin or studio, these garden timber buildings is that perfect extra room without the expense and frustration of building works. Being versatile these traditional portable buildings can be used as garden rooms so whether its arts and crafts, a study, a therapy studio, familys computer room, a music room, pool room or games room for the children they provide that extra space. These British / Cornish timber buildings are light, airy and spacious and are renowned for strength and longevity, very robust and sensibly priced, a luxurious and sophisticated cabin. Our timber buildings can be tailor made to suit your individual requirements, we want to complement your garden space here in Cornwall with a garden building of superior quality inside and out, providing you with an extension to your home for living, entertaining, dinning, gymnasuim, home cinema, hobby room, utility room or simply relaxing which will add beauty and style to any garden. A quiet place you can call your own with a touch of class which will stand tall and proud in your garden, a solid and secure structure that could add value to your property here in Cornwall. With one of the biggest displays in Cornwall, we normally have all our products on show so that you can view the quality of our garden timber buildings, rather than relying on seeing a picture or what people say So, come and see for yourselves, you will be amazed by the number of different designs and the quality of our timber products, ranging from basic timber garden sheds to heavy duty workshops to very stylish summerhouses and studios. We can supply and deliver all our garden timber buildings to any of the following areas in Cornwall: Penzance, St Ives, Hayle, Helston, Camborne, Redruth, Penryn, Falmouth, Truro, St Mawes, St Agnes, Newquay, St Austell, St Columb, Par, Fowey, Looe, Lostwithiel, Liskeard, Callington, Launceston, Camelford, Boscastle, Tintagel, Delabole, Port Isaac, Padstow, Wadebridge and Bodmin. If the area you live in is not included please contact us to discuss on 01209 860269.